Compass Box Delilah's XXV Limited Edition (46.0%): "For Delilah I want a sort of distilled Jean Simmons, Vivien Leigh and a generous touch of Lana Turner..." These were the words of the great Cecil B. DeMill when asked who he would like to cast for the role of Delilah for his masterpiece... And shortly after he ended up casting Hedy Lamarr for the role. When I first read this it immediately made me think of John Glaser's new blend he created for Delilah. Like Cecil B. DeMill was describing the blend of his dreams for his character Delilah I can totally picture Mike Miller passionately elucidating his idea of a perfect blend when he approached to John Glaser for their second collaboration... 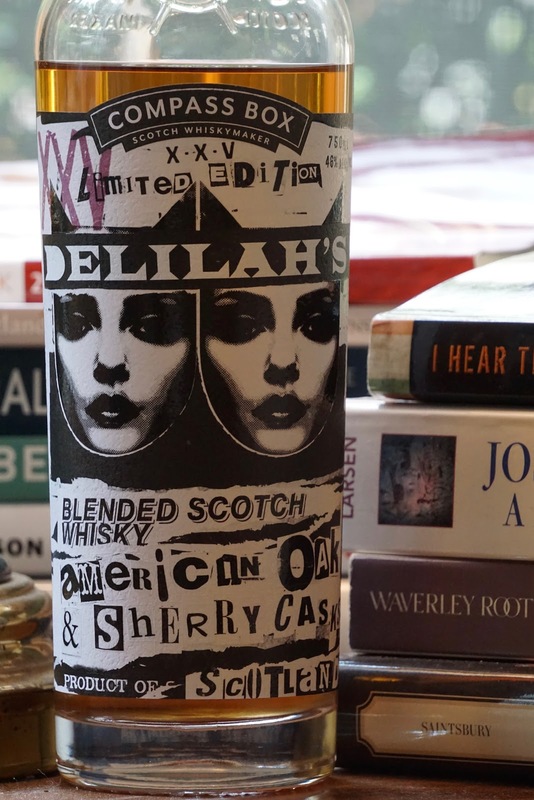 Eventually that idea became a reality and the result is sitting on my desk today: Compass Box Delilah's XXV Limited Edition to celebrate Delilah's 25th anniversary. As you will remember the first collaboration between Compass Box and Delilah was back in 2013 to celebrate the world famous punk and whisky bar's 20th anniversary and that very same blend actually is in the dna of this new release. Apparently some small portion of the original blend which contained 48% grain whisky from Cameronbridge, 40% single malt whisky from Teaninich and 12% single malt whisky from Glen Elgin was already aging in refill hogsheads for the last five years and when the discussions between John Glaser and Mike Miller started to create a new blend I bet it was pretty obvious where they will start from. So, that aging whisky in barrels ended up forming 29% of the XXV special edition. On top of that Glaser used malt whiskies from Miltonduff (10.5%), Teaninich (20%), Linkwood (15%) and from an undisclosed distillery "near" the town of Aberlour (15%) as well as grain whisky from Cameronbridge (10.5%). The release yielded 8,520 bottles. Color: Gold, light colored honey... Thick and slow moving legs all around the glass. Nose: Fuji apples, apple strudel and bees wax. Quite a sherry influence on the nose. Red wine vinegar, figs and cloves. Cinnamon and nutmeg dusting and fresh cilantro. Deep fried butter and creme caramel with a heavily burnt top. Palate: What an entrance... Too much stuff going on, let me take my time here a little. First notes are mostly ex-bourbon casks originated: Vanilla, grilled pineapple rings and lemon-mint Ricola drops. Eucalyptus... Then comes the mouth covering spices: Cloves, cinnamon and sweet paprika. Brown Muscovado sugar, tart molasses and dried fruits. Dates, prunes and dried figs. Old oxidized thick PX sherry and well aged rum. Finish: Long... Black pepper, rum again and more brown sugar. Overall: We are in a totally different ballgame here if we compare both of the Delilah releases. XXV is heavily textured, sweet, spicy and packed with dried fruits. Not made for shooting like the first release. Perfect after dinner sipper... I think I will save the rest of the bottle for colder months. It is chewy but very easy going... It also is bottled at a perfect strength at 46% abv. Although I was a little skeptical in the beginning about it you really don't want the abv to be higher. its's just right... Well, at the end it's not a cheap bottle I have to admit but totally worth it. I am definitely considering to get another one before it disappears for good.